The definite article is important: the feature referred to, part of a gigantic designed landscape at the gateway to the Scottish Highlands, is romantic rather than peculiar. The epithet is, in fact, a personal title and its origins are curious – an English peerage that, by means of a strategic marriage to a member of the Derby family, fell, in the eighteenth century into the hands of the ambitious and avaricious Murray dukes of Atholl, and the title, curiously, could pass through the female line. My visit to this artificially enhanced cave on the slopes of Craig a Barns, above Dunkeld, came about this afternoon as part of a current project. This concerns a set of 250 small botanical drawings, mounted on cards, that functioned both as an educational toy and what I have termed an ‘herbarium portabile’. The work of Lady Charlotte Murray (1754-1808), eldest daughter of the third Duke of Atholl, they were painted between 1781 and 1784 during summers spent at Atholl House (now Blair Castle) and Dunkeld House, the family’s two highland Perthshire homes. Following the devastation of Atholl House by her Jacobite paternal grandfather Lord George Murray, Charlotte’s father not only claimed the dukedom by marrying the daughter of Lord George’s Hanoverian brother, the second Duke, but set about restoring the castle with sumptuous baroque interiors that stagger the eye when compared with the austerity of the mountainous views from their windows. 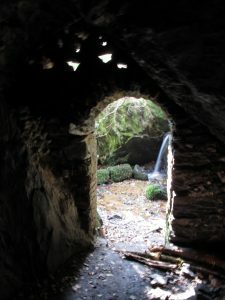 He also constructed a series of romantic landscapes around some of the vast estate’s dramatic natural features: eyecatcher towers were placed on hills, an Adamesque viewing pavilion to overlook a sublime waterfall on the River Braan, paths were laid out, trees (most famously larches) and ornamental shrubs planted, caves and grottos built. This winter has been a long one; spring, it seemed, would never come, but at last a chiffchaff was singing. Here, at the Highland Boundary Fault, the noisy nuthatch, denizen of southern deciduous woods has now met up with the equally vocal crossbill of the northern pine forest. In the clear waters of the picturesque Poltney Loch the leaves of the yellow waterlily (which Lady Charlotte painted) and of Potamogeton natans have not, however, yet quite dared to rise to the meniscus that they will so gracefully dapple when summer eventually arrives. 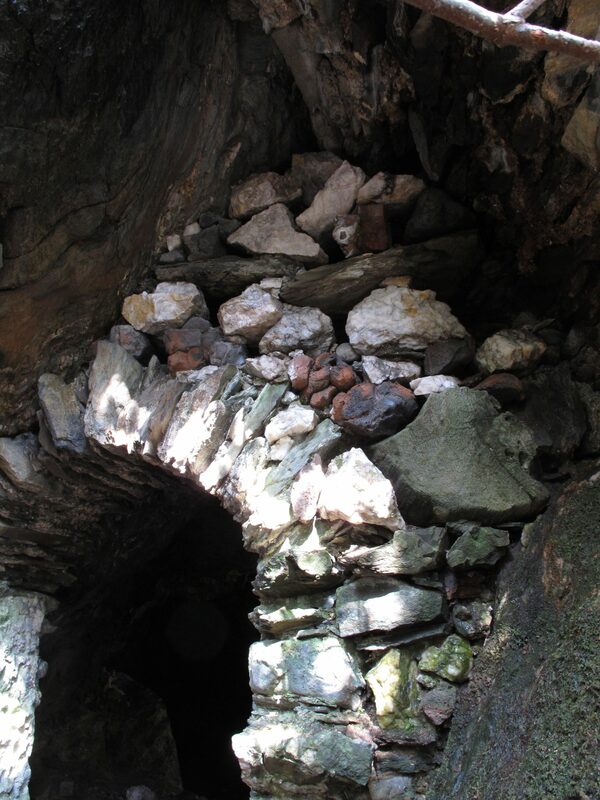 I headed upwards and found the foundations of the ‘Castle i’ the Air’ raised by the Duke on Craig a Barns in 1760, but I had forgotten the path to what has come to be known as ‘Lady Charlotte’s Cave’. A glamorous mountain biker kindly shared her OS map on which the cave was marked and the day was saved. A cliff-face of schist soared above the woods (now thicker than the Planter Duke, Charlotte’s brother, the very unpleasant fourth holder of the title, could ever have imagined) and I started to climb. The first clue was a drystone wall supporting a footpath, above which was a grove of dark yews: a characteristic fusion of nature and artifice. 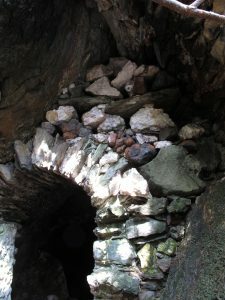 The twisted limbs of a fallen, but still living, elm half-concealed an arch – man-made, but of rough, natural stones – which disappeared behind a massive rock, and beneath another, to form a souterrain. This forms an echo chamber to magnify the sound of a small waterfall glimpsed and framed through a second arch. This arch is asymmetrically placed, so that at its top left corner, to block the gap, is a spandrel of rockwork: of white quartzite, industrial slag and rust-coloured bricks, pierced with small geometric openings through which the cave is dimly illuminated like a byzantine church. Passing beneath it one emerges into a second ‘chamber’, but an open one, roofed by a canopy of the evergreen leaves of an ancient Portugal laurel, backed by a dark, dripping rock with a thick pelt of moss, over which leaps the water of the miniature cascade. The cavern was made – or rather ‘improved’ – for the Duke, who paid his enforced labour in kind, with 22 pints of whisky that cost him three pounds, seventeen shillings and eight pence. As it was he who referred to it as the ‘Strange Grotto’ this shows that it was made for his wife. She was born Lady Charlotte Murray and that their eldest daughter bore the same name has led to confusion as to the tutelary deity of the cavern. It was, however, the mother who had inherited the Barony of Strange. The grotto was inaugurated on the duke’s birthday on 4 May 1774, doubtless with a celebratory picnic. Tragedy was shortly to strike. Dunkeld House was a beautifully proportioned mansion by William Bruce on the banks of a particularly majestic stretch of the Tay, just upstream from the ruins of the cathedral. It was here, only five months later, that the duke suffered a seizure, grabbed a beaker of hartshorn and swallowed it. Foaming at the mouth, raging with heat, he escaped his minders, plunged into the river and the following morning his bedraggled body was found eight miles downstream at Boat of Caputh. His widow became the Duchess Strange and spent the remaining 31 years of her life wandering from one English house to another, never to return to Dunkeld. The botanical drawings were perhaps made as a consolation for his daughter’s grief, but were put to good use in teaching botany both her own younger siblings and, after the death of her brother’s first wife in 1790, to her nieces – one of whom, Amelia, would inherit the collection.